Happy Autumn everyone! I can’t believe it’s finally fall–I even crunched over some golden sycamore leaves earlier today. The dogwoods are purpling, the goldenrod is blooming, and the sun even peeped out a bit today (maybe we’ll get some vibrant blue skies soon!). This evening for dinner I wanted to celebrate the season, and what better way than with some locally foraged Chicken of the Woods mushrooms?! They were back at the farmers market this past Saturday so of course I had to pick up a few. Determined to outwit the all-too-easily dried-out fungi, I did a quick search for braised chicken recipes. 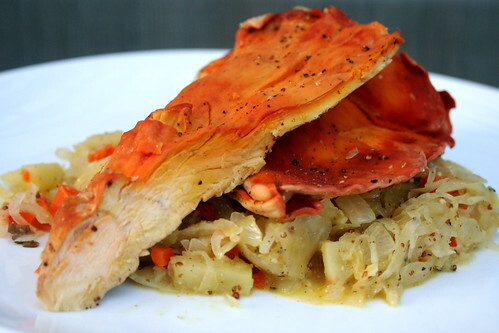 One of the first ones I came across was this one from Food & Wine Magazine: Braised Chicken Thighs with Sauerkraut. Delicious sounding, no? Maybe a little more “wintery” than “fallish,” but, hey, the mushrooms and apples and carrots are in-season so that makes it an autumn dish to me. Plus anything with cabbage or sauerkraut gets a two-thumbs-up in my book. Braising the mushrooms worked out perfectly–they turned out moist and tender, exactly what I was hoping for–and the sauerkraut is absolutely delicious. It’s tangy and earthy and sweet, just like autumn! Even when the mushrooms aren’t in season, I’m keeping this recipe in my repertoire. I hope everyone’s enjoying the beginning of the season, and don’t forget, Vegan MoFo 2009 starts October 1. Head over to Kittee’s site for more details and to sign up! In a large deep frying pan or dutch oven, heat the olive oil over medium heat. Meanwhile, sprinkle the Chicken of the Woods mushrooms with the 1/2 tsp salt and the pepper. Cook in the pan or dutch oven for 2 minutes, flip, and cook another 2 minutes, until browned on each side. Be careful not to overcook the mushrooms–you just want a light sear. Remove from the pan/pot. Add the onion, carrot, and apple to the pan. Cook over medium heat, covered, for 5 minutes. Stir in the sauerkraut, broth, the remaining 1/4 teaspoon salt, the mustard, juniper berries, and bay leaf. Bring to a simmer, reduce the heat, and cook, covered, for 20 minutes. After the sauerkraut has cooked for 20 minutes, arrange the mushrooms in an even layer on top and cook for an additional 8-10 minutes, until tender. Remove the mushrooms from the pan and discard the bay leaf. If too much liquid remains in the pan, raise the heat to moderately high and cook until slightly thickened. Serve the sauerkraut topped with the mushrooms. DUDE my mouth is watering right now. That looks so f’in good. I am preparing myself for the grieving process I’ll endure once the Heirlooms disappear until next year. I should consider indoor hydroponic organic gardening. Mushrooms and sauerkraut…sounds good! Is there anything that would be a good substitution for the juniper berries? You could leave out the juniper berries and it would still be delicious! Okay, that looks so good I’m ALMOST willing to look for these mushrooms and try it. But I really hate mushrooms. But I really love sauerkraut. What a quandary! WOW! This dish looks positively gourmet, it is just stunning. And I’m sure it tastes just as good as it looks. I am so curious about these mushrooms. Definitely need to go hunt some down. I love, love, love sauerkraut and mushrooms together. This is beautiful! Wow, that looks delicious! I wonder if they have that sort of mushroom at YDFM! And here I was, wondering, “what the heck? Chicken?” Now: I wonder what the heck a mushroom like that tastes like. I love mushrooms and cabbage together, so I can imagine mushrooms and sauerkraut is just as yummy. i super love me some sauerkraut & mushroom yumminess, too! your dish looks so pretty – and just perfect for fall, if ya ask me! mmmmmmm! All I can say is that sauerkraut and juniper berries is a damn good combination! I think my parents always throw them into sauerkraut. That looks fantastic. I wish I could get those mushrooms here, your blog is the first time I have heard of them! Mushroom man at the markets I go to certainly never has them.